Abstract: If your consumer electronics break, what's stopping you from trying to fix it yourself? A few weeks ago our inexpensive $50-dollar Omnitech OT-EMC7A micro cut paper shredder from Staples.ca gave up the ghost and stopped working. Being out of warranty, I took a stab at fixing the wee beastie. PCSTATS is going to divert from our usual crop of fantastically in-depth motherboard reviews and discuss for a moment, the topic of busted consumer electronics. China is without a doubt the punching bag of the world when it comes to complaining about electronics that prematurely break, but isn't this because the overwhelming majority of consumer electronics are manufactured in this country? Now a debate on nationalist manufacturing pride is beyond my pay grade and inevitably everyone walks away angry.... so PCSTATS is going side-step that quagmire and simply pose a question to you. If your consumer electronics break, what's stopping you from trying to fix it yourself? Stop, really think about that question for a moment. In answering that question, go beyond the superficial stuff and distill the problem down to it's elemental aspects. I think it fundamentally comes down to having the right knowledge, proper tools and resources (in this case, parts). As an over-simplified example; if your TV remote control stopped working you would remove the batteries, get new ones and make it work again. In this scenario your hands are the tools, the local drug store is your resource for batteries and your knowledge base tells you that once the remote control's power supply runs down, it's time to change it. My point is, even if you only have two of the three fundamental aspects of this problem covered - say; fresh AA batteries and hands to open up the remote control - you can usually solve the third (knowing the batteries need to be changed). If the warranty is expired and the only alternative is the garbage bin, why not try to fix it yourself? A few weeks ago our inexpensive $50-dollar Omnitech OT-EMC7A micro cut paper shredder from Staples.ca gave up the ghost and stopped working. Being out of warranty, I took a stab at fixing the wee beastie. First I checked the simple things; was it plugged in... was the power button on... was the safety interlock switch triggered by the waste paper basket... was there a visible paper jam? With no issues on all these counts I turned to Google and researched common shredder problems. 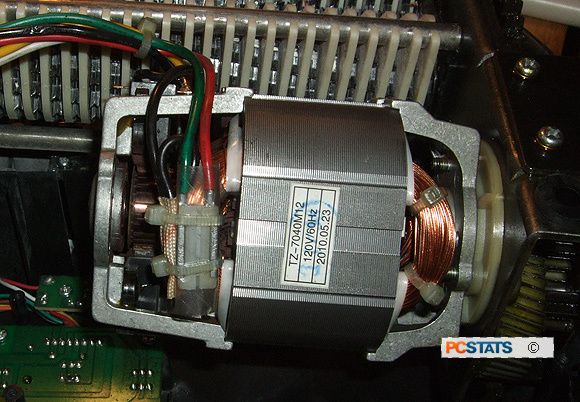 The most common issues were overheating motors and paper jams in the shred feed sensor. Since it wasn't overheated, the next step was to look for a paper jam inside the Omnitech OT-EMC7A shredder. Using a phillips screwdriver the fasteners were removed and the case opened up. A pair of infrared LEDs are used in this shredder by the paper slot to sense when paper is being fed in. These LEDs WERE blocked by scraps of shredded paper so I removed that clutter and used tape to seal up the area so the same issue couldn't reoccur. Unfortunately this wasn't the problem. The shredder still didn't work. The next step was to check the internal wire harnesses for loose connections. After that failed to resolve the problem, I worked backwards from the power plug (*while unplugged*) to check the functionality of the primary power switch and safety interlock switch with a simple continuity test. Both worked fine. 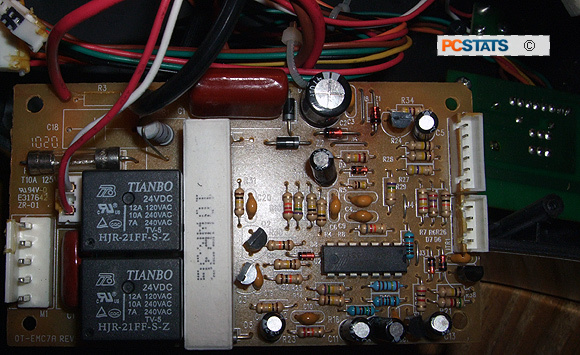 Inside Omnitech's OT-EMC7A shredder is a small circuit board behind the top switches and a medium sized circuit board with an integrated circuit, a fuse and some relays and assorted electronic bric a brac. I'm far from an expert in electronics so anything beyond checking the continuity of the fuse is usually a challenge. The fuse was okay. Drat. Up until this point I knew what I was doing. Moving forward I relied on what little I remembered from school electronics classes, the ability to use Google to find information and a $10 digital multimeter. With the shedders' switches, safety switches, thermal safety switch, fuse, infrared LED sensor and motor now crossed off the list potential problem areas I was left with a circuit board about the size of a business card. Replacement electrical components could be pulled from old computer power supplies kicking around the PCSTATS labs, or purchased from a local electronics store...I had a soldering iron and multimeter... What I lacked was knowledge of HOW TO troubleshoot the circuit. A bit of research on Google (keyword: fixing broken power supply) quickly led me in the directly of three electrical components as the likely culprits for this shredder failure; the diode, the transistor and the capacitor. Having witnessed many a blown and burst capacitor on computer motherboards I knew what bad capacitors looked like, so scratch that. Since there were no visual signs of catastrophically failed diodes or transistors I needed to know how to test these components on the circuit board. Google led me to useless (paid) About.com entries first, before grudgingly giving up useful information on this page: "Making Electrical Measurements Part 3: Testing Diodes and Transistors". 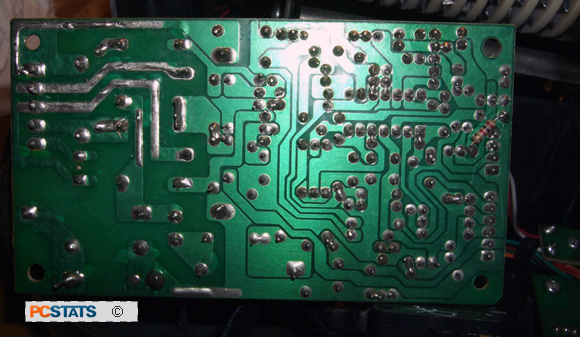 In my previous research looking for causes of dead power supplies, more than a few service technicians had taken the time to write about their experiences and point fingers at bad diodes as the leading cause of faulty power supplies. Could a bad diode in the rectifier circuit be at fault? Everything on the 120V side of the circuit checked out OK. A rectifier converts alternating current (AC) into direct current (DC) and is usually made up from four diodes arranged a certain way. If that part of the circuit was at fault it would certainly prevent the status LED from lighting up - the only visible clue I had to work with aside from the motor itself. As there was a bit of discolouration to the circuit board substrate around a pair of diodes connected to the 120V trace, I set about testing these components as described on "Making Electrical Measurements Part 3: Testing Diodes and Transistors" with a multimeter. Diodes only allow electric current to flow one direction while blocking it from flowing in the opposite direction. Sure enough, both diodes tested BAD! 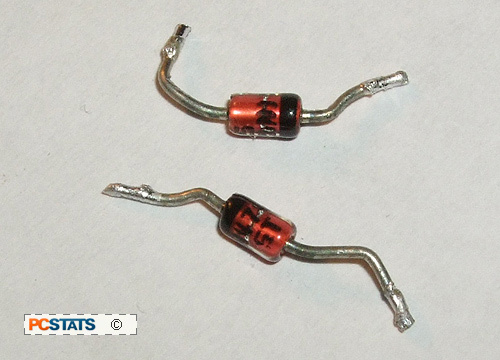 The two bad diodes were unsoldered from the circuit board and replaced with similar diodes pulled from an old computer power supply. The shredder was powered up and low and behold... it worked once more! It cost $0.00 to replace those two bad didoes. 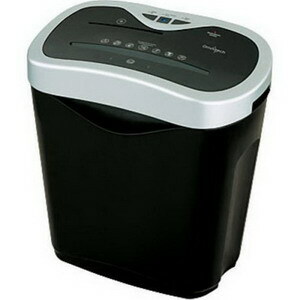 Not having to buy a new shredder saved $50-bucks and a cubic foot of landfill somewhere in North America. I call that a win even if this challenge did take a couple hours one evening to work through. I'll caveat this fix by admitting I still don't know enough about circuits to troubleshoot them, I got lucky. By working backwards I was able to fix a relatively simple issue by process of elimination. 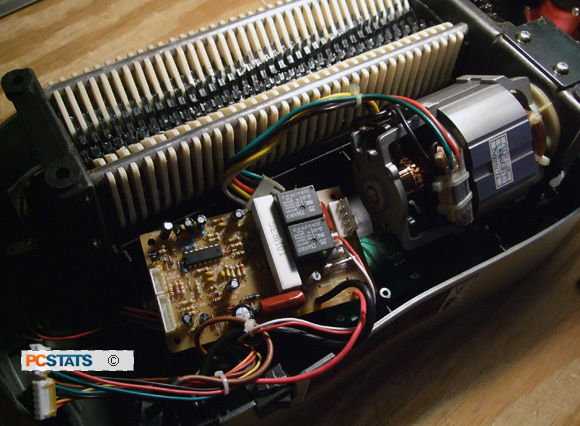 It's quite possible that the bad diodes were a symptom of something else and not the cause of the shredder's failure. It's also true that a little bit of knowledge can be dangerous. If I hadn't taken a couple years of fundamental electronics classes in school I could have carelessly electrocuted myself with 120V AC. The point of this editorial is not to guide you through how to fix a dead Omnitech OT-EMC7A shredder from Staples.com, it's merely to drive the point home that in today's world there's no reason not to TRY and fix busted consumer electronics if your only alternative is the garbage bin. We all have different capabilities and skills, sure, but with a little common sense, a good measure of due diligence and access to the knowledge base that exists on the internet, quite a lot is possible. If you have the tools and resources, chances are good with a bit of research you can track down the knowledge. Got feedback? We'd like to hear what you think, drop me a line here. - AMD vs. Intel - Which is the Better Processor Now? - AMD vs. Intel: What to Get? Which is Better? - Computer Recycling - Where Should Old Computers Go?